It seems like every other program on Japanese TV has something to do with food. One program that I watched featured the biography of Nobu Matsuhisa, he of the restaurant Nobu. One of the dishes he showed on TV piqued the interest of Yuki’s mom, so the next night we set out to try and replicate it…Fluke sashimi. It’s really quite simple. 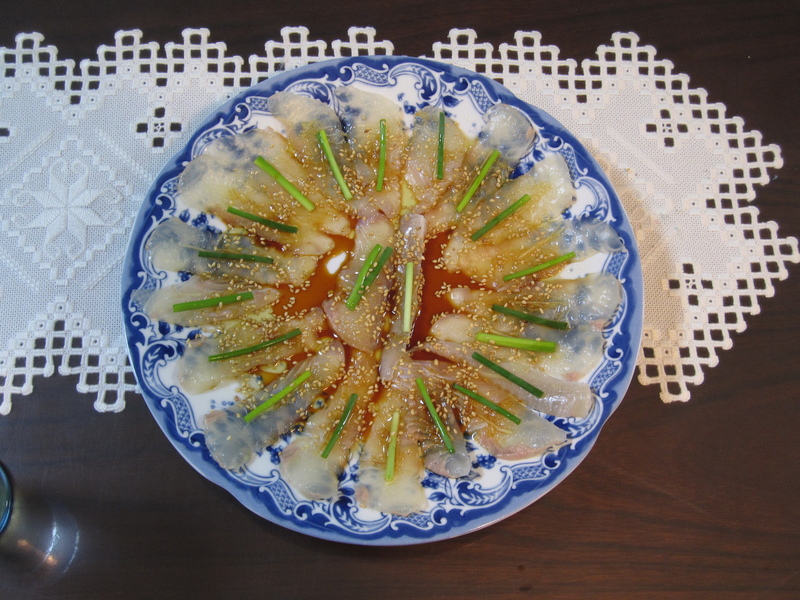 Slice a piece of fluke as thinly as possible and arrange on the plate without overlapping each slice of sashimi. Mash some garlic and lightly brush a little over each slice. On top of that lay down thin sticks of ginger and chives. In a small pot heat up equal parts soy oil and sesame oil until smoking hot. With a metal spoon dish some of the hot oil on top of the fish so that it sizzles a little. Then, drizzle with some ponzu and toasted sesame seeds. 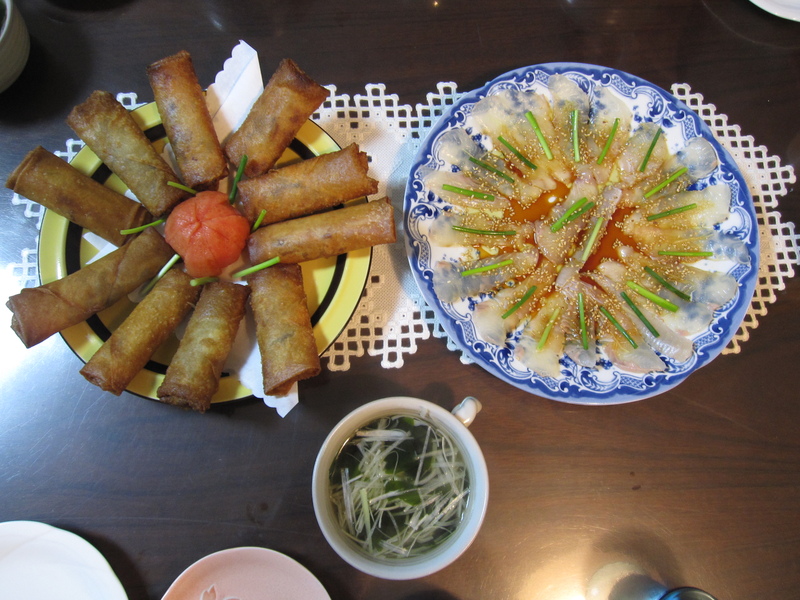 To go with it Uichiro made his special harumaki, spring rolls. He “took the two best recipes and combined them into his own which is now the best.” I won’t give you measurements so I don’t spoil his secret, but the harumaki contain shiitake, bamboo shoots, leek, pork, ginger, oil, sake, chicken stock, soy sauce, sugar, pepper, starch, and spring roll skins. Cook it all together, roll them up, then deep fry them to golden perfection and serve with Chinese Mustard. There was also some clear broth soup with shredded green onion and wakame.